The 2019 BMW 8 Series is exploding back on the scene in a thunderous way. This highly sought-after coupe is reminiscent of its iconic ancestor namesake, but with all the modern gadgets that savvy buyers demand today. The bold and stunning exterior implores you to come inside and explore the well-appointed interior cabin. There you will delight in every aspect of the advanced amenities it holds. Sterling BMW is the highest-rated BMW center in OC on major review sites, partly due to its many 2019 BMW 8 Series lease specials. As the best-rated BMW dealer in OC, we are proud to offer the best options on 2019 BMW 8 Series leases in Orange County, CA and near Irvine, CA. You will find our exceptional sales team on hand seven-days a week, ready to present you with a 2019 BMW 8 Series lease in Newport Beach, CA and near Costa Mesa, CA. When you are ready to lease a 2019 BMW 8 Series in Newport Beach, CA, stop by and talk to the knowledgeable staff here at Sterling BMW. Here you will discover the many wonders that make up this extraordinary sports coupe. This, of course, begins with a comfortable and luxuriously appointed interior that includes extended Merino leather-upholstered seats, stainless steel fabric trim and an instrument panel adorned with a Nappa leather finish. Nestled in the instrument panel is a giant 10.25-inch central information display. This high-tech piece of equipment includes 20 GB of multimedia storage, navigation, two USB ports and Bluetooth®. The three-spoke leather-wrapped, M sport steering wheel features controls for the audio system and hand-free mobile phone communication. 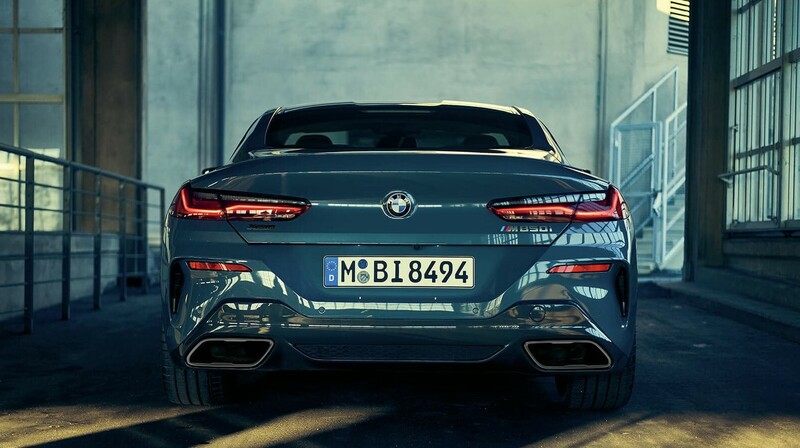 This rounds out the many exceptional attributes of the 2019 BMW 8 Series in Orange County, CA. Hold your breath before peeking under the hood of the 2019 BMW 8 Series. There you will find a powerhouse 4.4-liter BMW M Performance, TwinPower Turbo V8, 32-valve engine. This monstrous engine propels this other-worldly vehicle down the highway at up to 523 horsepower and 553 lb.-ft. of torque. This masterful engine pairs perfectly with an eight-speed Sport Automatic transmission. This advanced transmission comes complete with steering wheel-mounted paddle shifters, Launch Control and sport or manual shift modes. The team at Sterling BMW is pleased to present the striking and speedy 2019 BMW 8 Series, back after a 20-year hiatus. Stop by today and take one of these remarkable coupes for a drive around the block – and beyond.